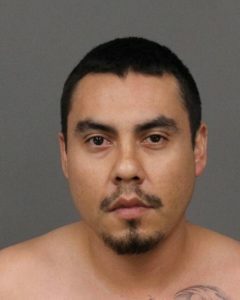 Last week, Julio Cesar Alonso stabbed to death his girlfriend Paulina Ramirez-Diaz at a home where the couple lived with Ramirez-Diaz’s parents, according to the SLO County Sheriff’s Office. Following Alonso’s arrest, it became apparent that he had been deported to Mexico last August. Alonso’s criminal record includes at least several convictions. In 2014, Alonso began serving a four-year sentence for evading or attempting to evade a peace officer while driving recklessly, as well as for possession of a controlled substance, burglary, vandalism and driving under the influence causing bodily harm. Alonso was convicted of each of the crimes in Santa Barbara County. In Dec. 2015, Alonso was released on parole. He was discharged from parole in 2016, but reportedly spent eight months at an ICE detention facility before being deported. Alonso has lived the majority of his life in the United States, according to an article published about him in The Desert Sun. On Friday, sheriff’s deputies briefly released Alonso from custody because the SLO County District Attorney’s Office has yet to file charges in the murder case. Sheriff’s spokesman Tony Cipolla said Alonso’s immigration status does not give the sheriff’s office the authority to hold him without a charge. Assistant District Attorney Lee Cunningham said prosecutors would decide on the charges they file following an autopsy that was scheduled to take place on Monday. Alonso will probably be arraigned on Tuesday or Wednesday, Cunningham said. Alonso is currently being held without bail, according to the sheriff’s office website. So he would qualify for the Deferred Action for Childhood Arrivals (DACA) is an American immigration policy founded by the Obama administration if it gets through the courts. The Democrats are determined to allow countless thousands and thousands of these criminals to enter the country and remain as long as they want. Anybody who calls for the laws to be enforced is called Deplorable and a racist. Meanwhile, the dead bodies of their victims just keep piling up. Yea its the democrats bringing in and paying for the migrant workers who don’t go back after a year visa. Generalizing this to one political party is part of the problem so don’t. I’m sorry Paulina and Paulina’s family. Our nation is lost and we can no longer protect ourselves. We have become so inept that we cannot keep our borders and cannot keep out criminals. We cannot even jail the criminals we do find. We are responsible for your death and we are sorry. If you have to leave the country you were born in ,, there probably is a good chance you was not doing so hot of a job at home , soooo you sneak into another country and do an even worse job of succeeding in life , and everything was free and/or reduced price for you in your new destination . But after your conviction everything will be free again ,, except you !!!!!! Release him into the custody of the girls family, I’m sure they will take proper care of him. “Sheriff’s spokesman Tony Cipolla said Alonso’s immigration status does not give the sheriff’s office the authority to hold him without a charge. What part of illegal immigration is not illegal enough to be held on? Also, it is not the guy’s “immigration status” that gives authority to the sheriff, it is… what? What agency with authority over the people-elected top LEO prevents the duly-elected sheriff from fulfilling his duty? My status is: I am tired. My status (being tired of this crap) authorizes the sheriff to hold people who are breaking our laws, pending charges, etc. There, my status, as a tax-paying productive citizen of the US, should over-rule a Mexican national’s status, while in the United States, right? Your in the country/state/ illegally , is no reason to hold someone, better find a new sheriff I’d say ..
maybe bring back Pat Hedges ??? … remember him, not sure he had these troubles? why do we need to abide by any laws?? hmmm ??? crazy stuff… Bozos leadership!! Without an immigration hold by DHS/ICE the Sheriff has no legal authority to hold someone in custody based solely on their immigration status. When was that? Yesterday? Don’t neglect the Five W’s of a good story. This is it, Example #1 , how did this man get back in our country? … its magic he just appeared , you know killing others is not wrong , he belongs in SLO County..
Stop bashing Trump , when we elected him just because of news stories like this!! “Stop bashing Trump” Lol waaah, if Milo gets to spew his trolling, El trumpo is fair game. It’s called free speech. “Clearly “WE” members of the GOP party are wrong ,we are racists” I did not think all of you were, I stand corrected. As for walls, you know Mexico has ladders and rope, crossing a 40′ wall is easy. And besides most of the illegals and drugs come in on trucks (nafta). Trump can’t fill the open gov positions, he will never build a wall. I’d put some electric on it …if was me let get a little jolt .Might help em get their mind ,come to think of it I see two others here could use a Jolt ,to get your mind right LOL..
19 to 5 , Hmm Clearly your a Odd Man out ..
“WE”? Speak for yourself. That is all.